Now instead of just glancing at your watch and looking for hands that point at numbers, you can stare at the moon cycle. This Monwatch is meant to be very deep and thought provoking. Although truthfully we think it’s probably just created by a Twilight obsessed fan. Just a theory. Apparently, it’s meant to establish some sort of a relationship between the moon cycle and a person’s emotional state. Yes, they really said that. If that doesn’t sound like a Twilight fan, we don’t know what does. Now should you no longer want to stare at the moon cycle, you can push a handy little button and check the time. One would think that it would show the time all the time, then you push a button to find out moon cycle, but that’s far too normal. 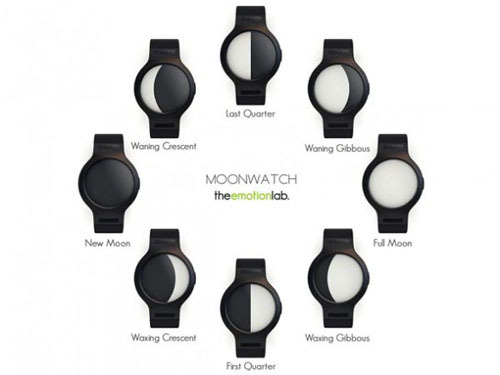 In order to find out the price on these you’ll have to contact The Emotion Lab.